One of the first Italian cheeses ever produced, Pecorino Romano was a staple for energy in every Roman legionnaire’s diet. Pecorino specifies sheep’s milk and Romano is for the Lazio countryside outside of ancient Rome where the cheese originated. Pecorino Romano PDO is made by a unique process called “rummaging the curds,” where curds are quickly drained and pierced before salting. The cheese can only be labeled “Genuino” if it is produced by one of the four remaining Lazio region producers, which accounts for only .9% of all Pecorino Romano production in Italy. 99% of Pecorino Romano is made in Sardinia; a move that started in 1884, when new regulations prohibited cheese salting inside of Rome’s shops. All of Atalanta’s Pecorino Romano is Genuino and made purely of fresh ewe’s milk from sheep that graze pastures just outside the city of Rome. Using time-honored production and maturation methods, Zerto Genuino Pecorino Romano comes by its full, classic sharp, salty flavor and signature grainy, crumbly texture naturally. Application: This ancient cheese has been essential to southern Italian cooking for eons. It is especially known for grating over pasta, potato and vegetable dishes but is also great for salads, soups and casseroles. With only a 4.5% salt content, Zerto Pecorino Romano also makes a good table cheese. Pairing: Whether as a table cheese or grated over pasta, Pecorino Romano pairs well with fruit-forward red wines like a Chianti Classico. In the southwestern corner of the Spanish Iberian Peninsula, pure breed Iberian pigs roam freely on the dehesas (derived from the Castilian word for pasture), a wonderland of forests, plains and lakes where oak trees grow in abundance. This pristine habitat provides unmatched breeding conditions for Iberian pigs, as well as a nutritious, all-natural acorn diet. Constant food foraging allows the pigs to fatten slowly and for those fat stores to penetrate deep into the muscles as the animals grow, resulting in supremely succulent meat. The ideal Iberian curing climate, passionate dedication to traditional preparations handed down from generation to generation, and a patient, slow-maturation process also contributes heavily into the inimitable, world-celebrated Iberico products. Pata Negra (meaning “black hoof” for the color of the Iberian pigs’ feet) Chorizo is handcrafted and skillfully seasoned with all natural ingredients, including paprika and other spices. 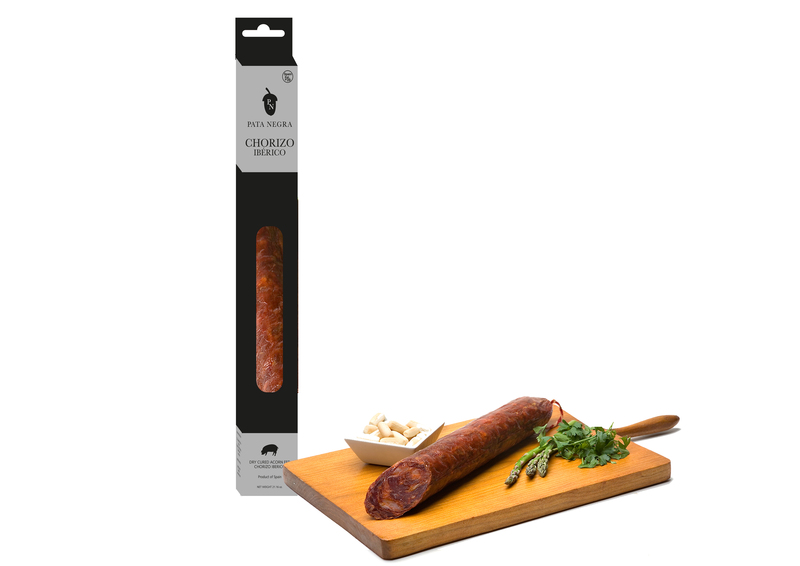 Dry cured for more than 60 days, this chorizo has the uniquely distinctive Iberian flavor and an exquisite aroma. Application: Slice and enjoy alone, for tapas, in sandwiches, quiches, egg dishes, grain and potato based dishes, or in soups and stews. Pata Negra Chorizo is also wonderful with beans. Pairing: For tapas the traditional pairing is dry Fino sherry, but one of Spain’s crisp white wines like an Albariño will also go well.